I was over in London a few weeks back meeting the team from hush and we got to talking about work wear. It's my new struggle. I have a job that doesn't require formal dress but I do want to look smarter than I usually dress. 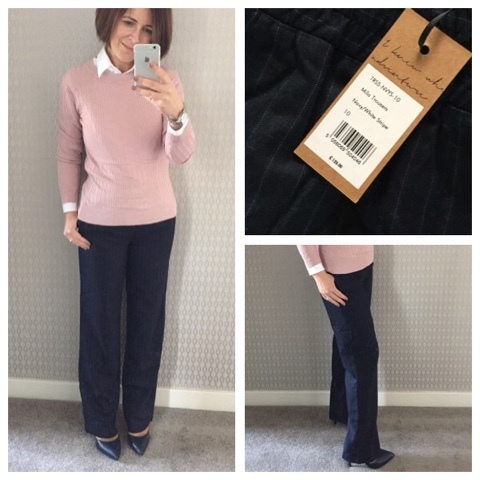 One way to do this is to ditch denim/skinny jeans and wear more trousers but apart from my M&S wide legs I featured on this post, I just can't find any trousers that are on trend, smarter than jeans, comfortable and will work hard in my wardrobe. So hush took on my feedback and offered to send me 5 pairs of their trouser styles for me to try on and pick one favourite to keep. I thought about the best ways to feature the items and decided that a good old try-on at home post would work best. No fancy photos - keeping it real! 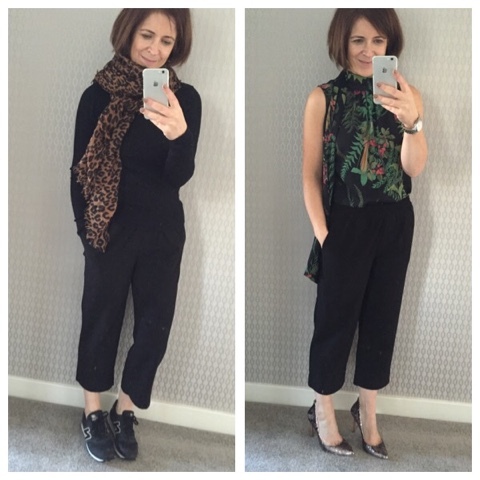 All the trousers I'm wearing in this post are a size 10 - they all have elasticated waist, side pockets and rear pockets. But they're all different and will suit different body shapes. Read on for more info. The Etoile jumper throughout is also from Hush - a new piece in their winter drop. I've a separate post coming up about it. Starting with the Winona Cropped Trouser. One I wasn't expecting to love as much as I did. They fit really nicely and although I can't pull off the ankle boot/cropped trouser look, I do love them with these pointed pumps and if you scroll down, I realised they are more versatile that I thought. I think what I like most about them is that they are quite on-trend and they push me outside my comfort zone a little bit. I'm wearing them with sheer tights to address the issue of winter legs. I could be wrong but I think they would work with black opaques too? 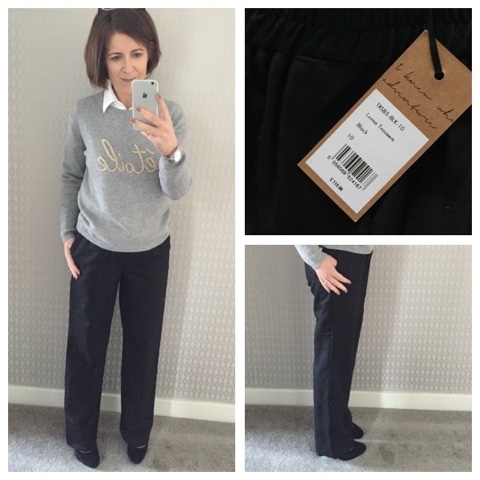 Next up, the Lorna Trousers, which have a bit of a kick out towards the ankle. These felt more snug on my waist and therefore weren't as comfortable to wear. Length was good for my 5'7" short leg (inside leg of about 30") figure but I did need a high heel which I'm not 100% ok with given the amount of running about I do. So they're going to be better for the taller girls out there. They've a high proportion of wool, hence the price and are super warm. All told, the deciding factor is that these are too long. Next up, the Winnie Trousers. Now these are not unlike the Lorna ones but they're not wool and therefore are less expensive. In my opinion, they hang much nicer for not being wool. I loved the fit of these however they are on the long side, like the Lornas, requiring heels. Next up, the Thea Trouser, a peg leg style in a silky feeling material so they look less black/black than the other pairs. I thought they looked good on but I didn't like the feel of the material and it caught a bit on my legs. Overall, the Thea's feel too casual in style so they're not for me. Finishing with the Mila trousers - also with a high wool content but these are navy instead of black and have a faint white pinstripe. These fitted well on the waist and the length was good, albeit quite long...about the same as the Lorna ones. I tried these on with a pink jumper from New Look as it was a nicer combination with the navy. I was seriously tempted by these mainly because I would love to get away from black at work! Decision made - I'm keeping the Cropped Winona's and I'm looking forward to wearing them lots all year round...not just during autumn/winter. Hope you found this post useful. If nothing else, it reminded me of the benefit of ordering a ton of different styles to try on in one sitting (and take pictures). It really helps with making the right decisions when you can try the item on with other pieces from your wardrobe (and different footwear). 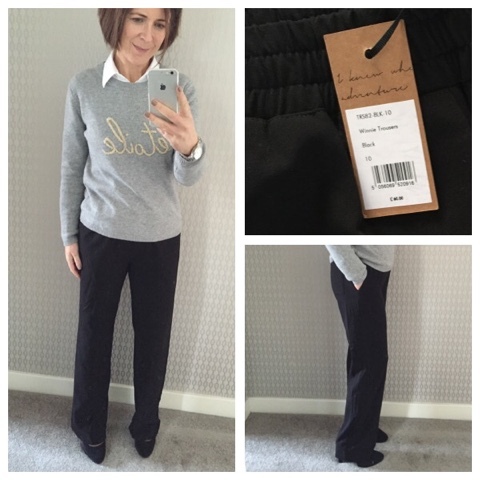 Thanks to the team at hush for supplying me with the trousers for this post. 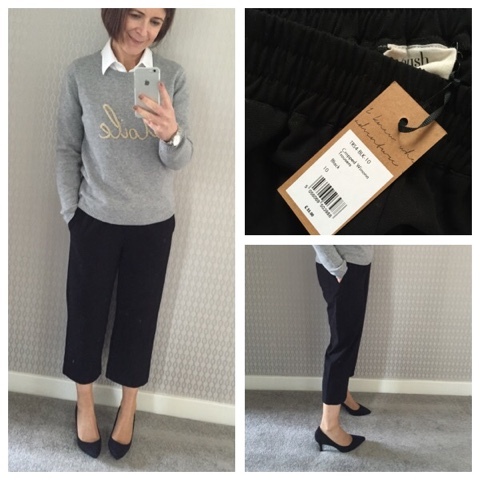 I was gifted the Winona Cropped Trousers and the Etoile Jumper but was not paid to write the post, nor was I obliged to. Thanks for supporting the brands that support this blog! So glad you chose the Winonas. They are the nicest by miles ... am considering a pair of cropped trousers at the moment, so thanks for the styling tips!